If you’re a observant neighbor, you may have noticed a few more backyard chicken coops in your community recently. The ability to raise chickens that produce fresh organic eggs in a relatively small space is enough for many to have taken the plunge. With good care, minimal cost and space, local families are able to raise a small chicken flock in their backyard! 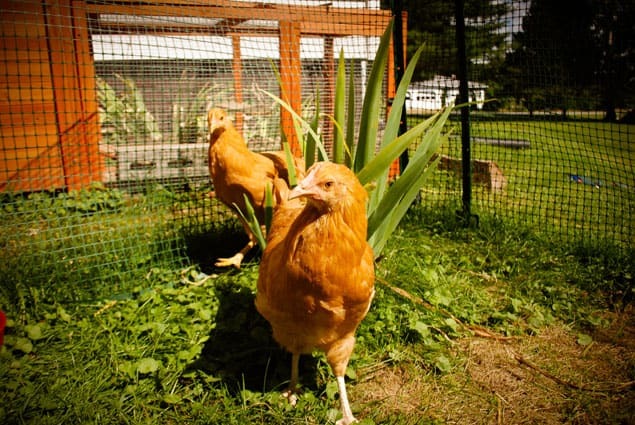 Getting started raising chickens can be a fun and educational experience for the whole family. The first step to take before purchasing a backyard flock is to set up a chicken coop. Many Vermonters design and build their own coops or transform old tree houses or doghouses into one, but for those who are less handy, coops and runs can be purchased at local feed stores. Deciding on a chicken breed and a coop are probably the most difficult choices when getting started. The remaining essentials include daily fresh water and feed, bedding such as pine shavings or straw in the colder months, a safely secured heat source, and weekly cleanings. When taking care for your animals it is important to think of the external forces that can affect your flock. Predators and weather can decimate a flock if chickens are not properly protected. With their nesting boxes ready, keep a careful eye on hens 24 weeks old. While it varies, most hens will start laying around this age. But be patient! Rushing the girls with layer feed while they are still young is not recommended. The surprise of that very first egg is oh so exciting!